« Separating The Sheep From The Goats. 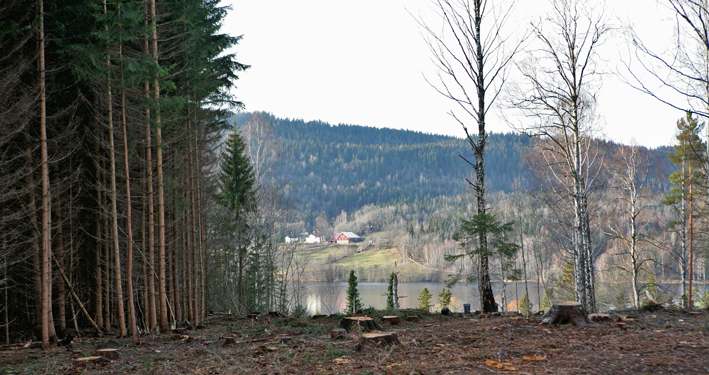 Up to a few weeks ago the spruces blocked this view across the lake to the horse farm on the other side. you people are like that, ruthless, regarding spruces and contribute to the gw, no? The truth is out. I’m a swine, read. They aren’t my spruce trees, although living next door I do feel like they were mine, in a way. I don’t know about the gw thing. Maybe, but I don’t think so. And I’m not pointing the finger at any of my friends, but I really don’t feel like being lectured on gw by anyone living in the US. These trees were planted sixty years ago, and the farmer who planted them had always planned to chop them down now, in 2009. That was why they were planted, they aren’t part of an ancient forest. It turned out that they weren’t very good quality wood. They had masses of small twigs that caused it to be poor grade lumber and also made it uncomfortable for the cows & me to walk through the forest. They also blocked the light to the birch trees, which I like a lot more than the spruce. I’m not exactly ruthless about spruces, it’s more that I just didn’t like those particular trees. The remaining spruce trees, the ones in the picture above, are ten years younger and a different kind that are supposed to be better quality wood. By the way, thanks for commenting! I had a feeling nobody would be interested in this picture. it’s a lot better when it’s a lot bigger. Regarding global warming and green house gases, planting new trees on this plot of land should be as good as leaving the old trees there. It might even be better in terms of carbon fixing, since growing new trees might do it better than just sitting there, fully grown and producing only new leaves and twigs to replace the ones that are falling down each year. For 60 years you’ve been transforming carbon into wood. Maybe it’s good to take that carbon away to make timber floors, doors, shelves or shingles, and start all over again. Thank you, Sig. I’m going to print out your comment and paste it to my forehead, in case anybody asks me again. Cos it’s nae tha noo. It wouldn’t make sense not to ever cut any trees at all. Who is ready to live without telephone poles, houses, and books? Better to grow trees in a sustainable way.